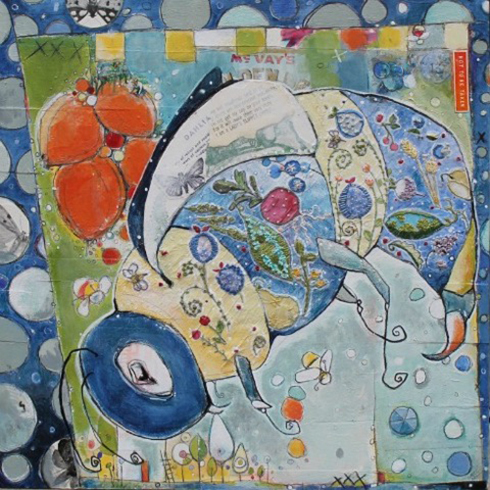 Jane Moore Houghton is a mixed media artist living and working in Central Massachusetts. Jane has been showing and selling her work since 2006. She has been granted six solo exhibitions since then, as well as several group shows. Jane’s latest series of works, her “Beasts” series, was shown in a solo exhibition at the Hanover Theatre for the Performing Arts this past winter. Jane’s “Beasts” series features large, enthralling portraits of endangered and at-risk animal and plant species. The intention for these portraits is to spark conversation between us, the holders of this place called Earth and those creatures with whom we share it. Jane’s unique technique of using embroidery on layers of tissue paper is featured in this series. Through the use of acrylic, gouache, watercolor, ink, vintage papers and tissue paper, Jane sews story seeds in the viewer’s imagination. The layered, mixed media of her pieces allows for contemplation about the values we claim to have and their impact on our co-journeyers whom we claim to love.